In 1934 Picasso returned to Spain for the first time in many years. Little did he know that this would be the last he would visit his native country. Together with Olga and Paulo, he visited Barcelona, Madrid, San Sebastien and Tok attending several bullfights on the way. The experience certainly inspired Picasso to produce a series of works representing the brutal conflict that took place in the bullring. 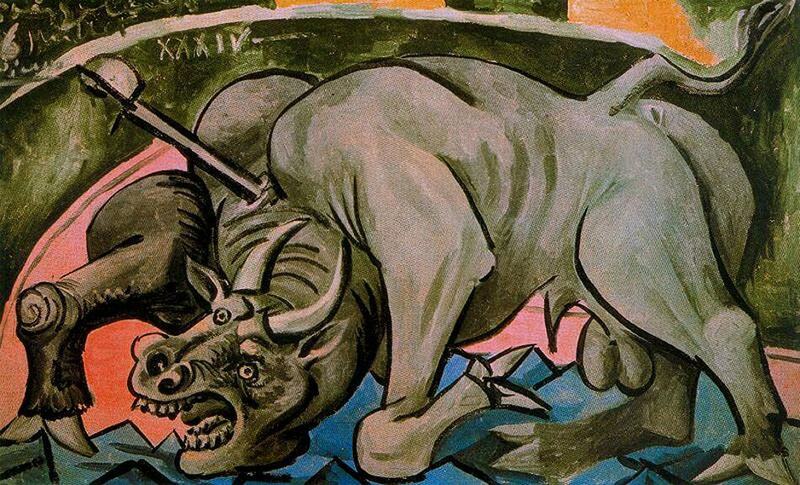 For Picasso, the struggle between the toreador and bull symbolized the co-existence of nobility and brutality in human nature. Indeed it was at this time that Picasso began to develop his series of works on the theme of the minotour - the mythological creature, half-man, half-bull; that Picasso frequently used to symbolize his own personality. Picasso's increasing emphasis on the fight to the death enacted in the bullring might also be read as a heightened awareness of the increasing division in Europe and fear a military conflict in the wake of the accession to power in Germany of Adolf Hitler's National Socialist Party.